Repair - a process quite laborious,requiring attention and responsible approach. To achieve the desired result quality by following a specific algorithm of action. For finishing floors and walls precedes the installation of interior doors, which are one of the most functional and aesthetic elements of the interior. Particular attention should be installing doorspay at the door: its dimensions, configuration and number of other parameters. 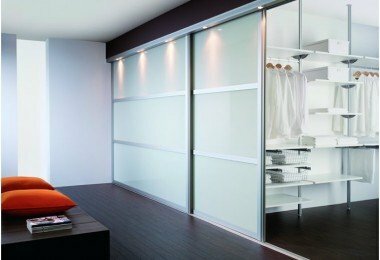 The fact that it is necessary to determine in advance exactly with the dimensions in order to avoid undesirable situations when it is necessary to order custom doors or engage additional finishing the walls. Than it would be obvious that in this case the door interior and repair in general premises owner cost significantly more. - Width can be 600 mm, 700 mm or 800 mm. However, a number of manufacturers present products,the width of which is equal to 550 mm, and height - 1900 mm. Furthermore, it varies not only these parameters but also the width of the door frame - from 15 mm to 45 mm. These data are extremely important when determiningthe size of the door opening, in which the interior doors will be installed. In case of neglect of these parameters can be a situation where the door frame just did not fit into the existing opening, which would entail the expansion and additional costs. Moreover, the presence of any utilities, plasterboard walls with a metal frame and complicate the process of expanding the opening. The downside would be the situation where the doorway is too large for the door. The narrowing of the opening will also entail the need to appeal to the civil organizations and the additional costs. 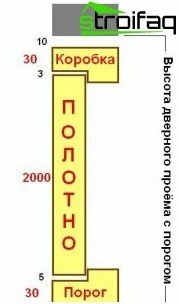 the presence and size threshold. The width of the door opening 800 mm is almost ideal for the majority of manufacturers of interior doors. These doors are easy to install in standard size doorways premises. Installation height is calculated similarly, depending on the availability threshold and mounting clearances. For this adjustment to the added thickness of the door panel of the box, the gap size (10-20 mm). 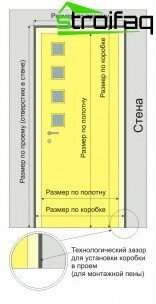 From this we can conclude that for the door leaf, whose dimensions are 2000 * 800 mm, an opening in the wall must be dimensioned 2050 * 880 mm. Also the width and height of the doorwayIt characterized even thickness. In typical homes standard doorways, more precisely, their thickness is 75 mm. 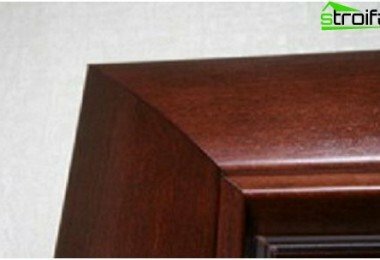 For this reason, manufacturers of interior doors offer the consumer door frames of the same thickness. This is sure to be taken into account when installing the door. Otherwise, we can talk about installing the extender box or drank along. If you do not take these measures, the subsequent installation casings can be problematic and lead to unattractive appearance door. To determine the parameter wall recommendedmeasure the thickness at three (at least) the points on all sides. 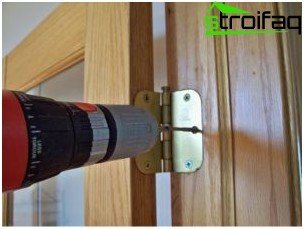 For the same parameters on the perimeter of the door opening is necessary to carry out an order of non-standard interior door. If the thickness varies in these points it is necessary to cut the door frame, and in some cases put transoms. The fact that unequal thickness indicates the curvature of the wall. If you do not take the necessary measures, it will not be possible to establish quality frames. Thus, currently availablecertain standards doorways. 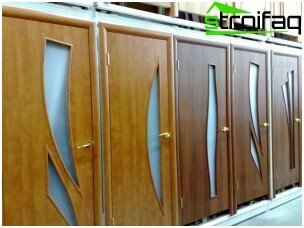 Competent approach to the measurement aperture settings, the calculation of its optimum size based on the desired size of the door leaf, a number of other nuances - all it allows high-quality and reliable installation of interior doors that will last more than one year. It will delight the home owners and their guests not only for its functionality and security, but also the aesthetic appearance, which is largely achieved with proper installation.